If you have been in the Fine Arts Room, you may have noticed the rows of black filing cabinets and built-in file drawers on the wall, right next to the door. (Or, you may not have. We understand that our ceiling is so beautiful that it gets all the attention.) Did you ever wonder what’s in these drawers? Some pretty amazing things! These drawers contain envelope upon envelope, carefully labeled and filed A-Z. In each envelope are brochures, clippings, and pictures from newspapers, magazines, and publications on all kinds of subjects ranging from Alvar Aalto to Franciso Zúñiga. We have files on artists, architects and all kinds of wonderful things. Like art movements, aquatints, and aqueducts. Bandboxes, bookplates and bridges. Canes, the circus, and cupids. And that’s only the first 3 letters of the alphabet! What’s the big deal about these clippings? 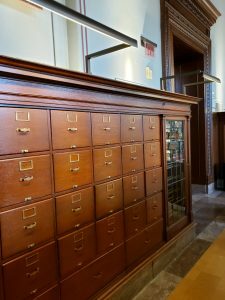 These files have been carefully maintained since at least 1912, when Central Library opened, although some items date from before then. 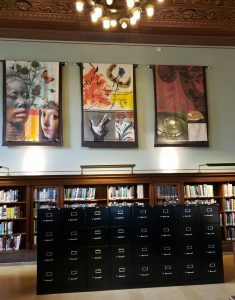 They were the Google and Google Images of their day, consulted by researchers, artists, designers, and advertising professionals; all great urban public libraries were known for this unique resource. They contain information that may never be online or in one of our databases. While the Internet is wonderful and our databases are excellent resources for research, the fact remains that not everything in print has been or will be digitized (or has the legal permission to be digitized). For example, our file on Haviland China (labeled as “Pottery and porcelain, Haviland”) contains a brochure on Limoges porcelain, a brochure from Haviland titled “Fine China . . . To Have and to USE,” newspaper ads with prices for Haviland from 1965, and much more. 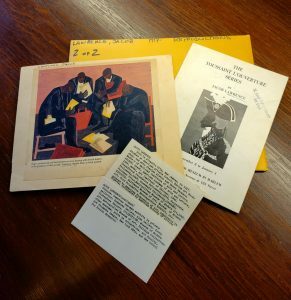 One file on artist Jacob Lawrence contains a brochure from The Studio Museum in Harlem’s exhibit of The Toussaint L’Ouverture Series, a postcard of “Builders #1” from the St. Louis Art Museum, a 1979 article from Artweek magazine, and much more. There is a second file that’s filled with reproductions of Lawrence’s paintings. 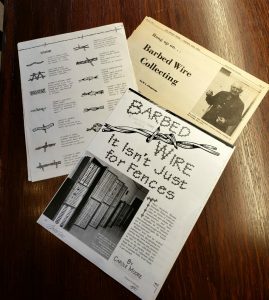 We even have a fascinating file on barbed wire! Maybe not a topic you would think of for an art file, but it contains a 1978 article from the St. Louis Globe-Democrat, a 1994 article from the Western Trader and drawings to help identify different styles of barbed wire for collectors, just to name a few of the items in this folder. When we help people with their research, we often ask if they would like us to pull a clippings file because we know the information in that envelope could possibly contain the perfect piece of information they are looking for. So if you are looking for information on a topic, please know that there’s more than meets the eye here in the Fine Arts Room. Please ask us at the desk and we’ll be happy to see if we have a clippings file that might be able to help!